BBC Three - Professor Green, Is It Time to Legalise Weed? 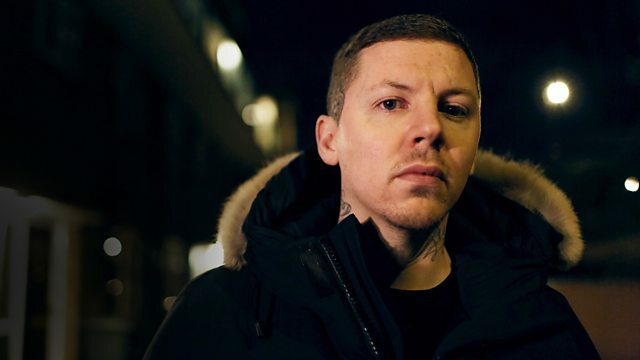 Rapper Professor Green presents a documentary looking at Britain's relationship with cannabis, exploring the arguments for and against legalisation. Rapper and documentary maker Professor Green has a past relationship with cannabis. Before finding success as a musician he sold weed, and between the ages of 16 and 24 he smoked cannabis every day, but things have changed since then. With those days behind him, Professor Green, aka Stephen Manderson, embarks on a uniquely personal film to take an in-depth look at our relationship with Britain's most popular illegal drug and explore the arguments for and against legalisation. Stephen explores today's booming UK cannabis industry, from the realities of life as a dealer, grower and even weed robber, to the consumers with ever-growing options about how and what they buy. With cannabis laws around the world now changing - as US states like California legalise the drug - Stephen meets those hoping to make their future millions out of legalisation here in the UK. He meets politician Nick Clegg to find out what conversations go on in 10 Downing Street, and the police force who are changing the rules. As he comes to reflect on his background and wrestle with his own past, Stephen explores addiction and the links between cannabis use and mental health.